On Sunday night we had two of our oldest friends over for dinner, and I pulled out one of my favourite festive meals - a glazed ham with peas and mac and cheese. So, you can see I've done the ham and peas festive meal many times before (in 2008, 2009, 2010, 2011, 2013 and 2014), usually with mac and cheese or a potato-based side. It's a great combo! Comforting but not stodgy, rich but not excessive. 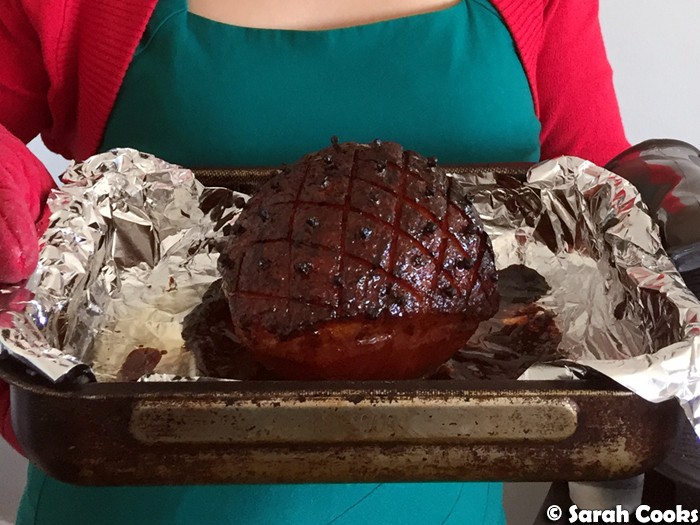 This year I tried Nigella's treacle glazed ham from Simply Nigella (and I'm still planning on doing a round-up post of all the lovely recipes I've been making from Queen Nigella's latest book!) Her recipe instructs you to purchase a gammon (i.e. 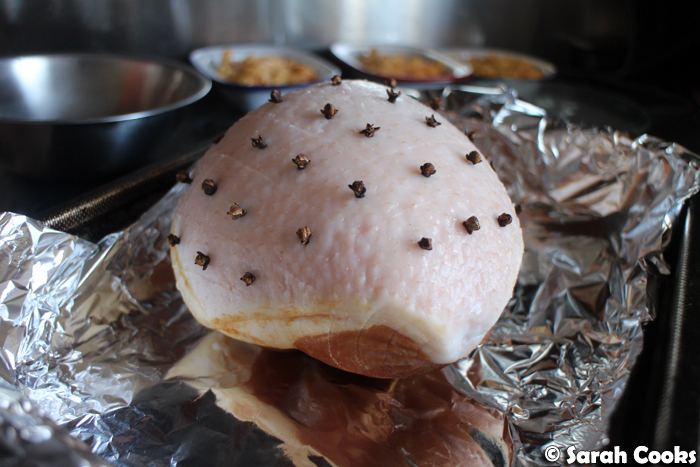 raw ham), and slowly cook it in a low-low-low oven for 12-24 hours, before studding with cloves and glazing in a treacle-mustard-sugar mixture. 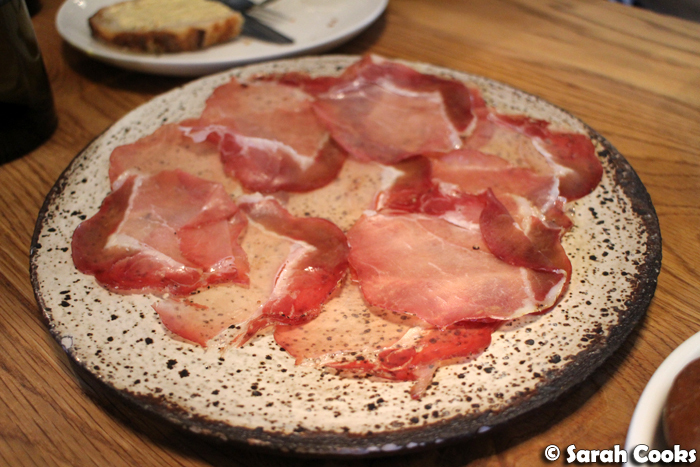 However, raw ham is extremely difficult to come by here in Australia. Our hams here are usually already smoked and cooked when you purchase them - they can be eaten cold straight away, or heated through if you prefer them hot. (During my Sarah Discovers How to Eat days, I always made Nigella's hams using pickled pork, which is the closest thing to raw ham that's readily available). So, for this meal, I bought a regular boneless ham and skipped the slow-cooking. All that I needed to do was to stud it with cloves and glaze it, before baking it in a 200C oven for half an hour, until it was heated through and burnished on the outside. N.B. this was for a one-kilo boneless ham, cutely called a "ham nugget" from Peter Bouchier. 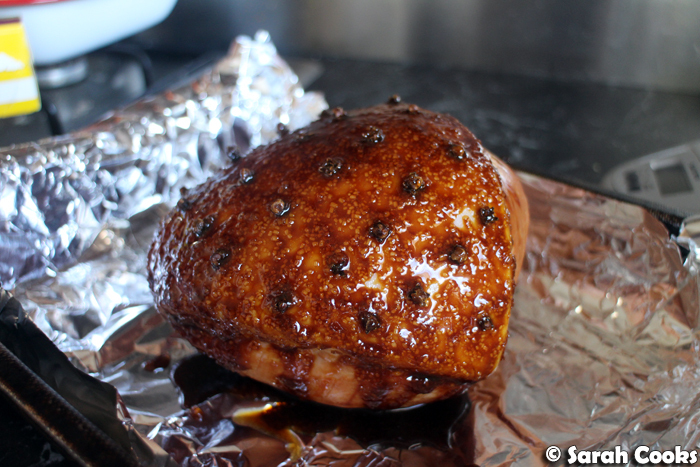 If it were a larger ham, I'd suggest wrapping it up in foil and baking at 180C until hot all the way through, then glazing it and baking at 200C for 20 minutes. This way it can heat through without the glaze burning. 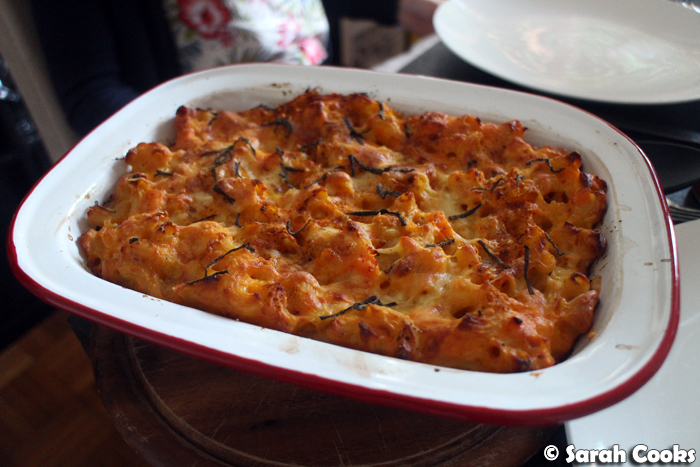 The mac and cheese of choice was Nigella's sweet potato mac and cheese, again from Simply Nigella. This is a regular mac and cheese (i.e. 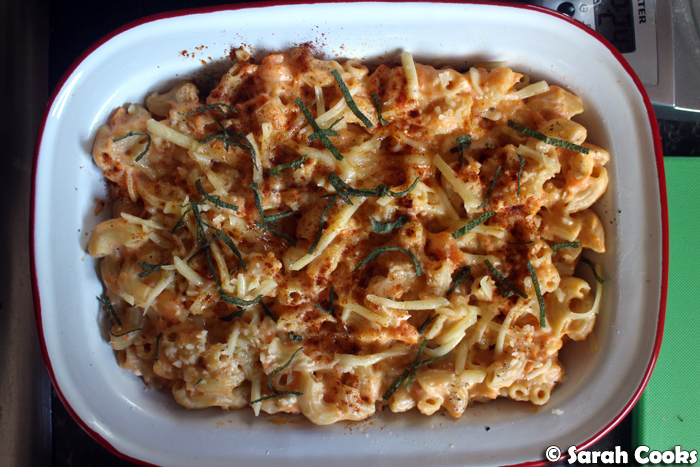 a white sauce, cheese and cooked pasta), with the addition of mashed sweet potato. (Plus a little paprika, mustard and sage for extra flavour). Super delicious! There was actually more than enough mac and cheese mixture to fill my enamel dish (and I knew that the amount in this dish would serve four generously as a side), so I took the remaining mixture and portioned it into individual mini tins, let them cool and refrigerated them for another lunch we were hosting the next day. 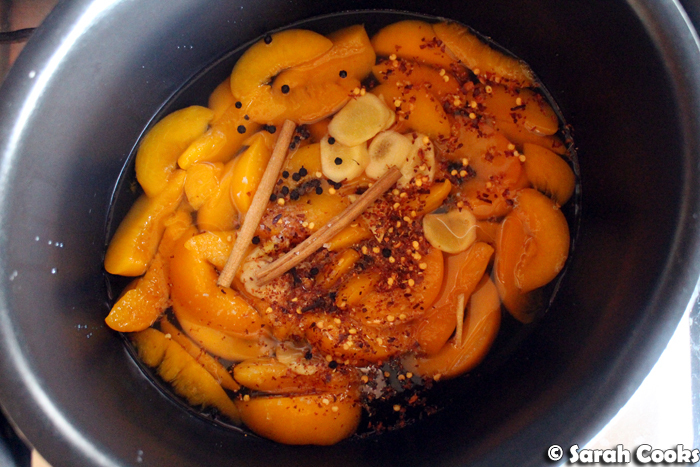 Nigella's spiced peaches! Interestingly enough, it's really hard to get peach halves in syrup these days - almost all the tinned fruit I saw at the supermarket was in juice. I think the colours of this one are so lovely and festive. Here's the ham! It goes dark quite quickly due to the treacle in the glaze, but certainly didn't taste burnt. 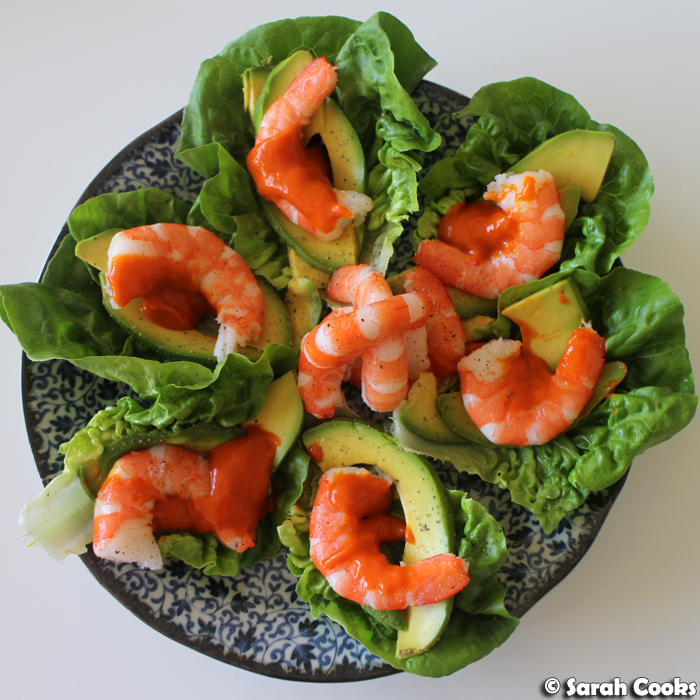 ... as well as these super pretty prawn cocktail lettuce cups! (Gem lettuce leaf, sliced avocado, lemon juice, salt, pepper, cooked prawn, cocktail sauce). Yum! I had been thinking about making prawn rolls (i.e. 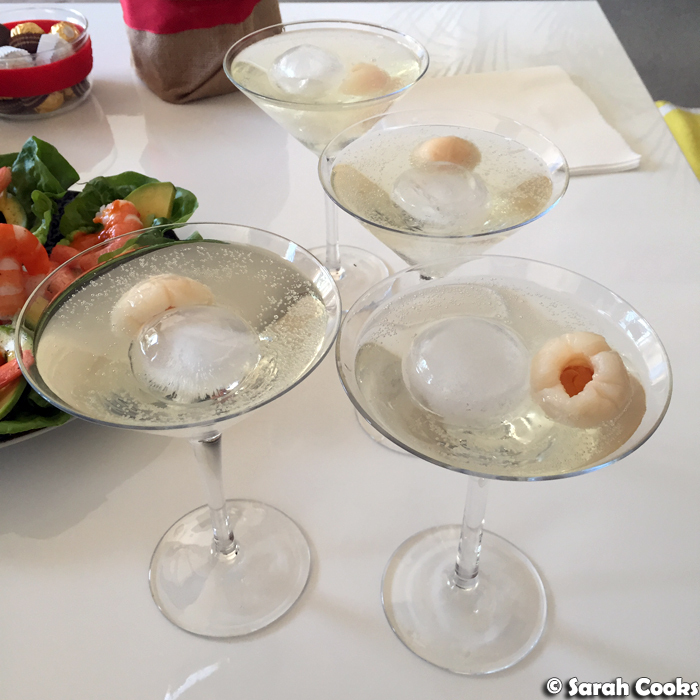 prawn cocktail mix in mini brioche buns) but I think that would have been way too filling before a big meal of ham! These were just perfect. And here's dinner! I love how it just fit on our table. 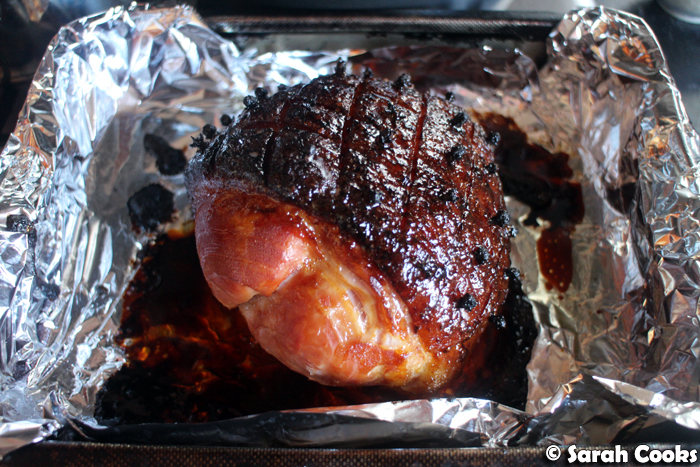 The ham was just gorgeous! I've decided that Peter Bouchier hams are now my favourite - I'll continue buying their hams every Christmas! It's got the perfect level of salt and smoke - deelicious. 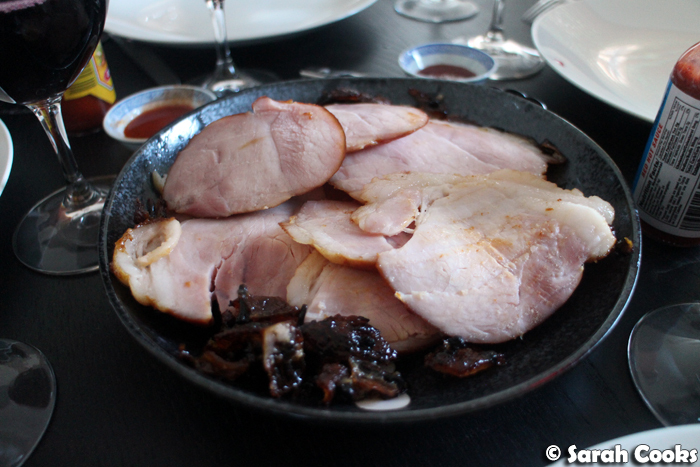 I loved the treacle glaze too (what is it about caramelised sugar and pork fat together that is just so good?) As you can see, some of the glazey bits fell off because the fat layer was a bit thick but I made sure to keep them because they were so damn tasty. 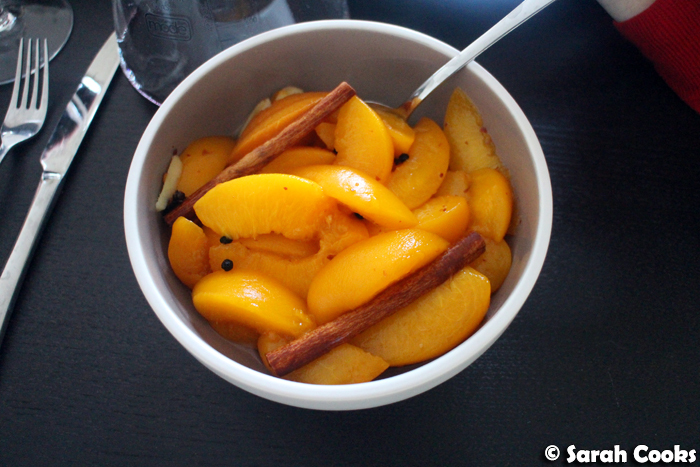 I really like Nigella's spiced peaches - the combo of sweetness and spicy warmth is just great with ham. 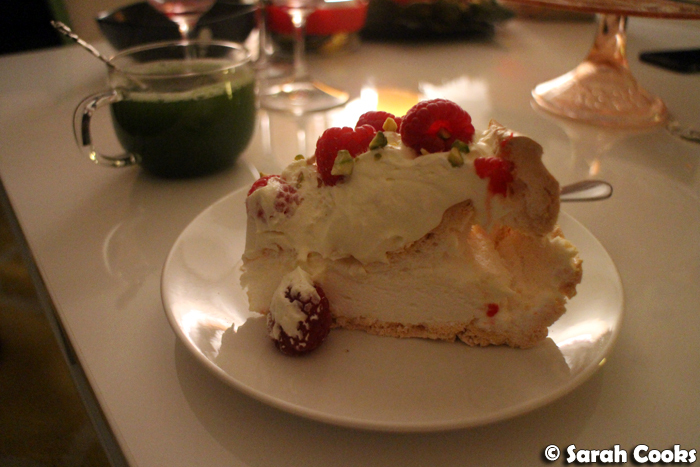 Dessert was pavlova! Australian Christmas classic. I went festive with ruby red raspberries and green pistachios for the topping. (And you can see in my first photo that I even matched my outfit too, heh). 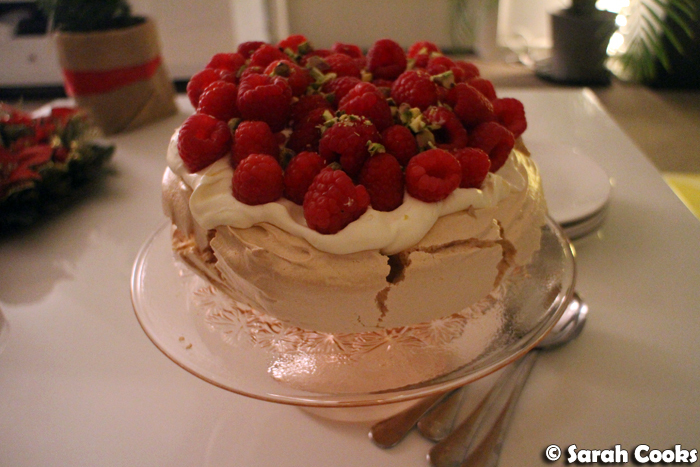 I always wonder if people think of pavlova as a boring dessert, especially as it's so popular. (I certainly make it very often!) But no, it always goes down really well. Everyone loves pavlova. Because it's frikkin great. We made a cup of matcha for my friend Adri to go with dessert - naturally, I couldn't resist sneaking in another festively red-and-green photo. The next day, we had our friend Duncan over for lunch. 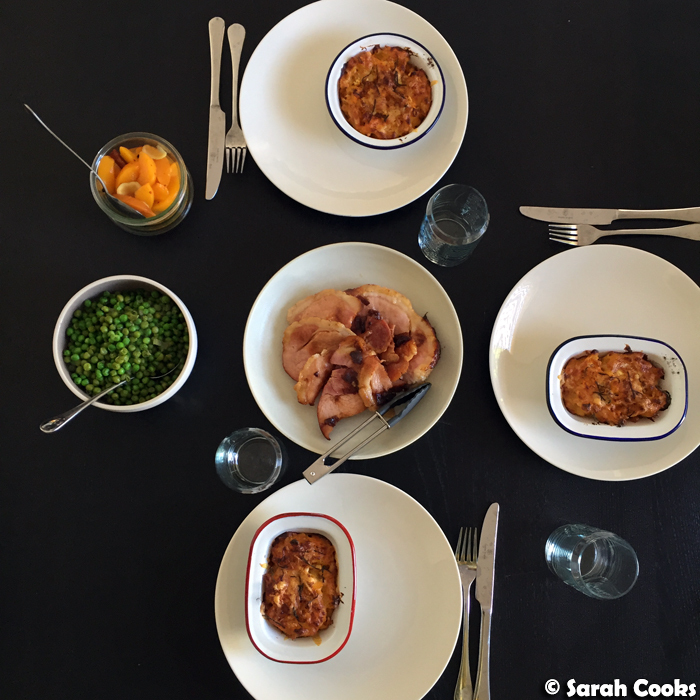 My initial plan had been to make a turkey and ham pie using leftover scraps of meat, but we had so many excellent leftovers from the ham dinner that it seemed like a waste to ignore them! So, I baked up the individual-portioned sweet potato mac and cheeses, wrapped the ham slices in foil and let them heat through in the oven whilst the mac and cheeses were cooking. 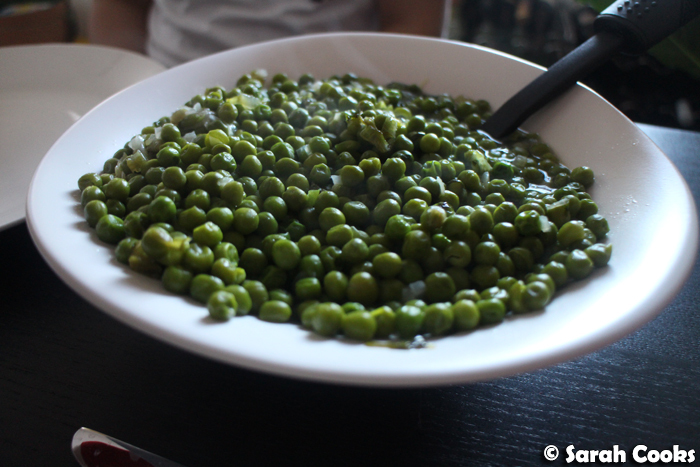 I reheated the leftover peas on the stove, adding an extra cup of frozen peas to make enough for three people, and put the spiced peaches out. Boom boom. Duncan loved the meal - hooray! I was worried he might not like a meal that was so obviously made of leftovers, but he enjoyed it, describing the peaches as "kick arse" and wondering out loud why people only eat ham for Christmas when it's so delicious. 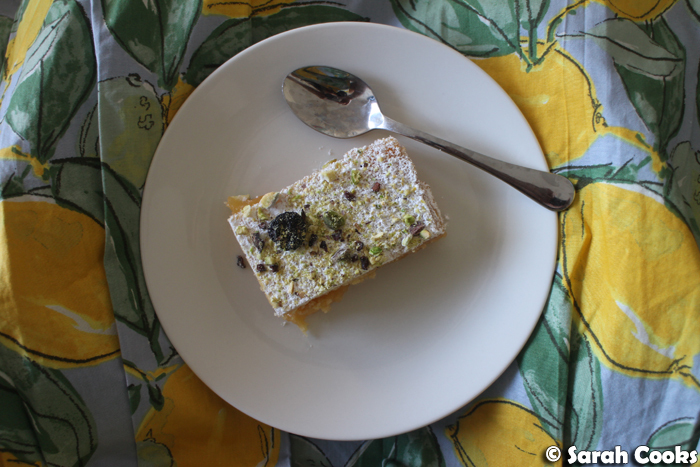 Duncan also brought a dessert - a luscious lemon slice (recipe from Belinda Jeffery's Mix & Bake). 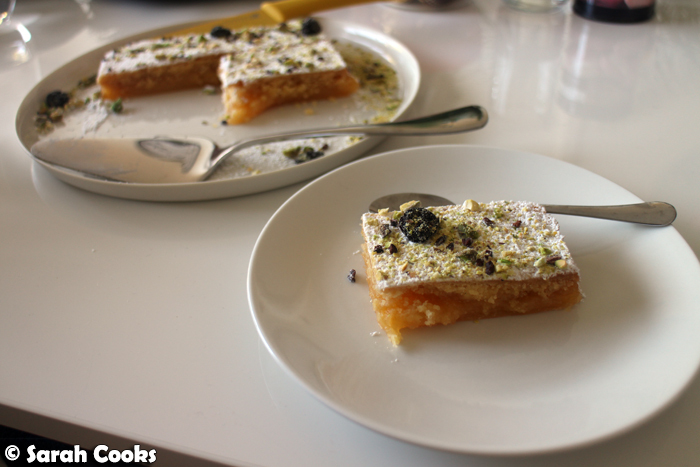 I loved the sunny golden colour and the rich butteriness of the shortbread layer. I was also ludicrously excited that the dessert matched my new Princess Highway lemon dress. Yay! Ok, so I think this is the last Christmas post I'll be doing this year, so I wanted to quickly show you some other Christmas-related deliciousness! In the week leading up to Christmas, I came down with a cold (booo), and had to take a day off work. 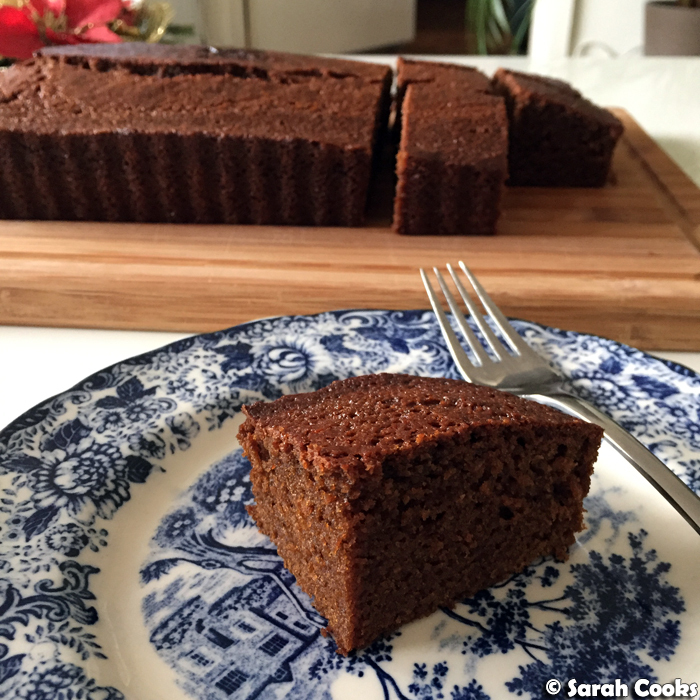 I spent most of the day in bed, but did manage to drag myself out to bake Nigella's Sticky Gingerbread (recipe from Nigella Christmas). It's so good! Lovely and moist and spicy. I liked it fresh out of the oven when it was still crunchy on the outside, but it keeps for ages. Now I want to go through all of Nigella's gingerbread recipes! (I can highly recommend the stem-ginger gingerbread from How to Eat, and I have my eye on the chocolate gingerbread from Feast next). 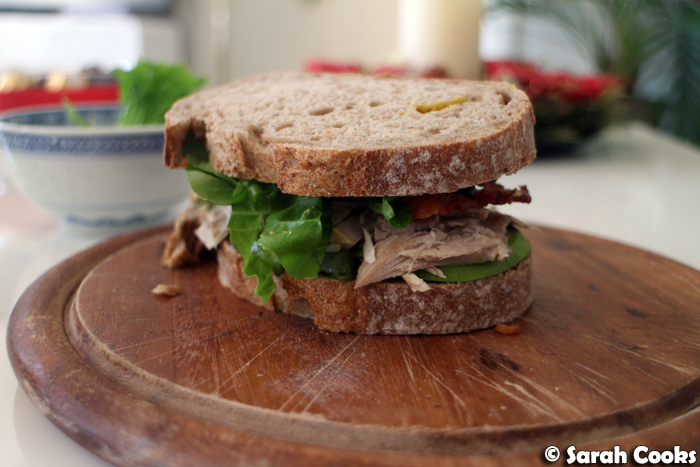 With the leftover turkey from Christmas dinner, I made myself a pretty epic sandwich. 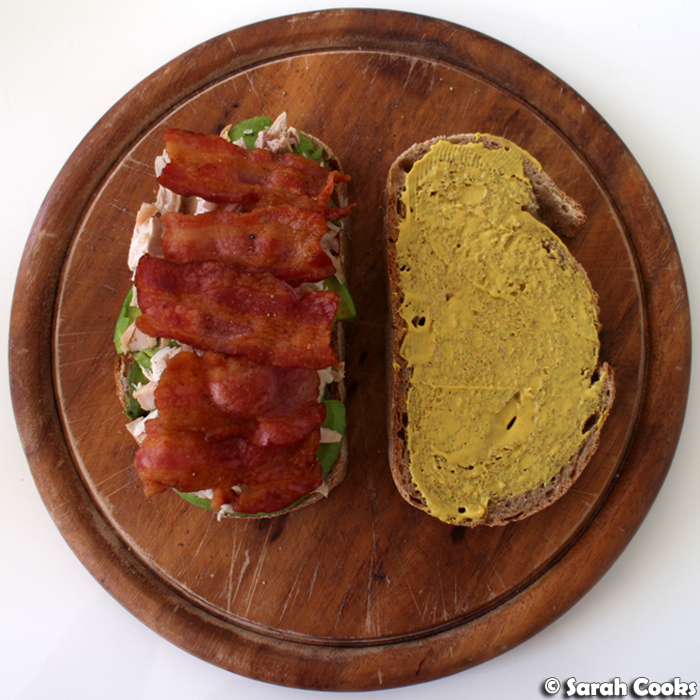 Light rye bread, avocado, turkey, crispy fried dry-cured streaky bacon, lettuce and hot German mustard. And finally, here's a little salad I made for dinner tonight - definitely in the mood for something light after all that feasting! 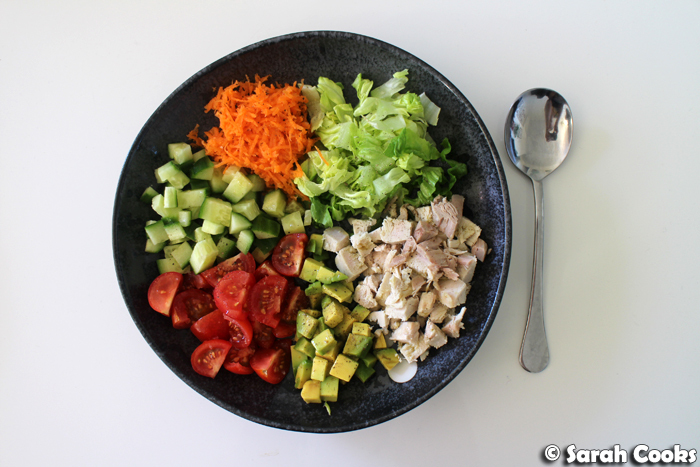 It's just a mixture of chopped vegetables that I found in the fridge (little gem lettuce, carrot, cucumber, cherry tomatoes, avocado) and chopped turkey meat dressed with extra virgin olive oil, lemon juice, salt and pepper. Refreshing and nourishing! Merry Christmas everybody! Hope you've all been enjoying the festive season! Merry Christmas! Phew, am I glad that it's Boxing Day! I've been super chill today, eating mince pies and pottering about the house. Very excited for a lazy week off from work! 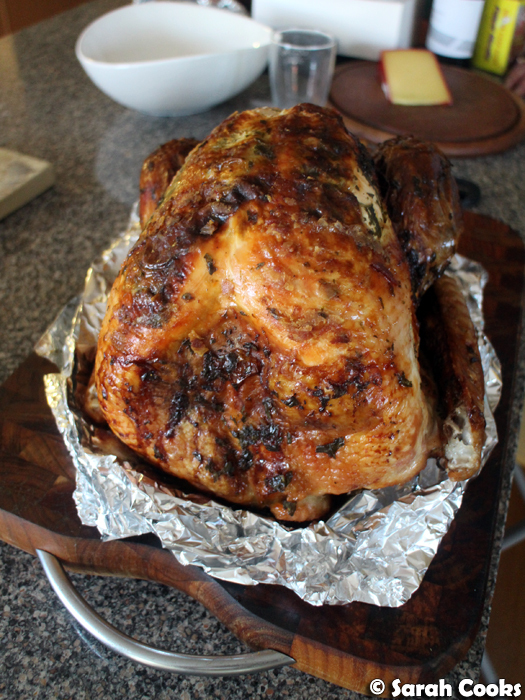 We had the big turkey dinner last night at my folks' house, and here's what I cooked. 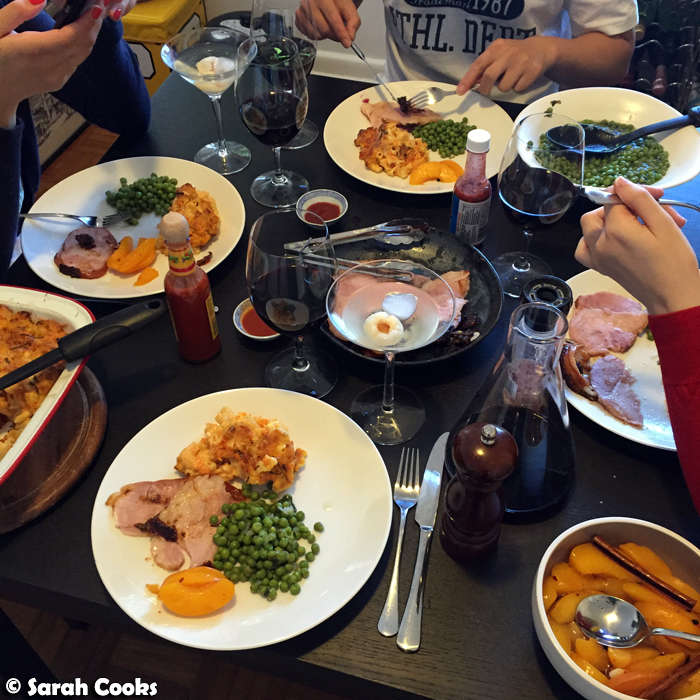 If you look at the bottom of this post, I've compiled a list of all the different Christmas dinners I've made, right from the first one in 2005 as part of the Sarah Discovers How to Eat project up until now. Looking back, it seems each year I jettison side dishes that we don't love (bread sauce, stuffing, any carb that isn't roast potatoes, any vegetable side that isn't red cabbage) until we get to what's most important - roast turkey, roast potatoes, red cabbage and Christmas pudding with custard. Simple and perfect! 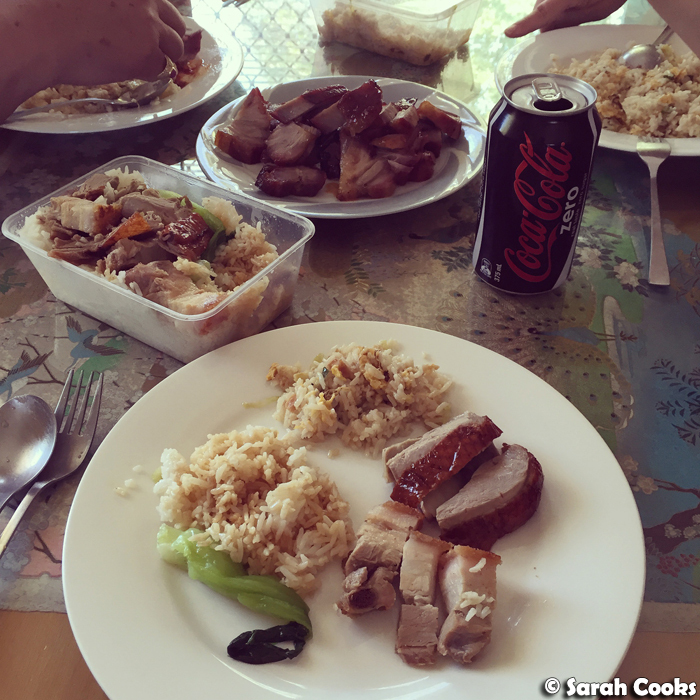 We went to mum and dad's in the afternoon and had some Hills BBQ takeaway for lunch - char siu and minced chicken salted fish fried rice for my folks, beef on fried noodles for Sandra, and roast duck and crispy roast pork on rice for me. Woo. After opening presents (YAY, presents! ), I started cooking. 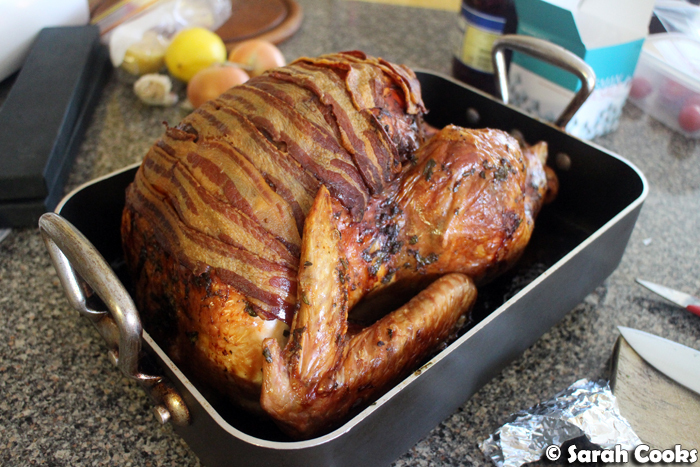 After many years of turkey-roasting, Gordon Ramsay's Christmas turkey has firmly established itself as my favourite! 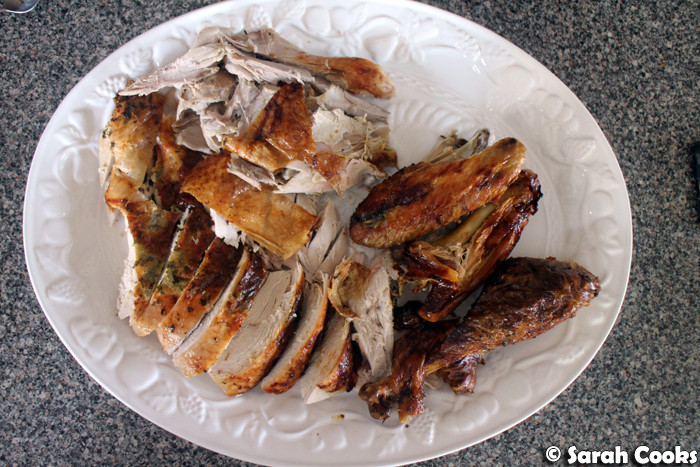 You can find the recipes for the turkey and gravy in my Christmas 2012 post, so here's just a quick overview. It's always turned out really well for me, and is pretty simple to make! 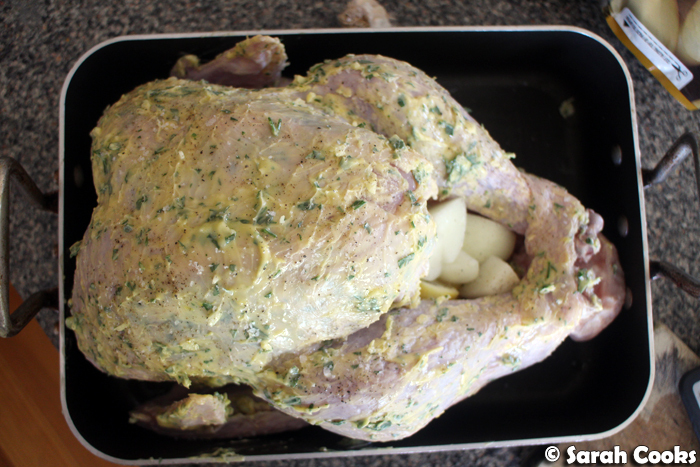 No need for brining or flipping the bird (heh), Gordon's turkey is smeared with a lemony herby butter, and the cavity filled with garlic, onions and lemon. (We bought the turkey, a lovely free-range bird, from Rendinas Butchery). 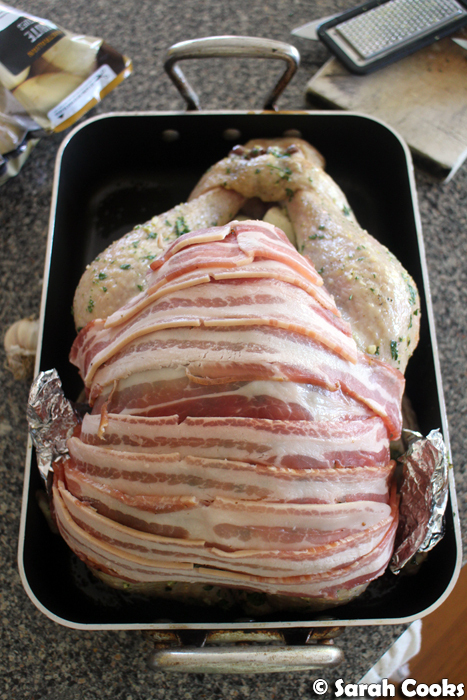 The breast is also covered with bacon to protect it during roasting and add extra flavour. Peter Bouchier dry-cured streaky bacon for the win! 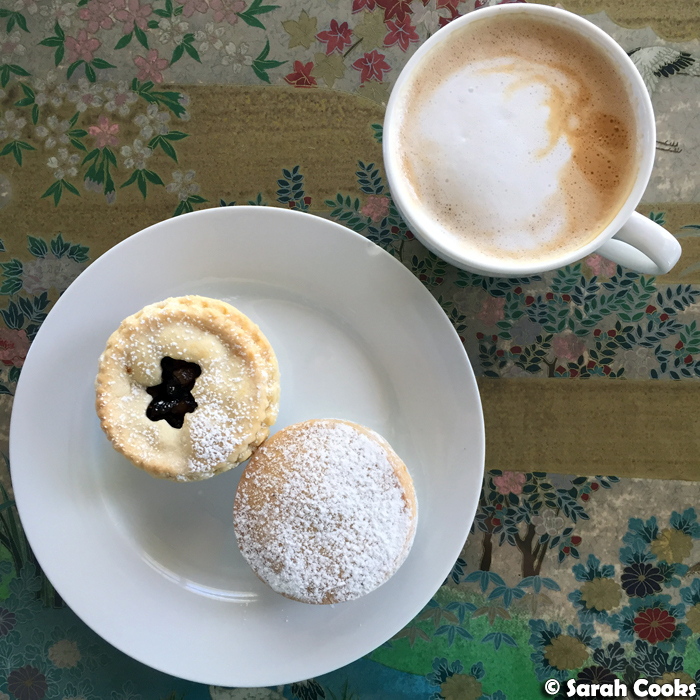 While the turkey was in the oven, it was time for a mince pie break! Dad bought mince pies from a couple of different places this year - the flat one is from Le Paul Patisserie (409 Whitehorse Road, Balwyn, VIC 3103) and the one with the adorable teddy bear cutout is from Harvest Bakery (255A Belmore Road, Balwyn North, VIC 3104). Both delicious! And here's the roasted turkey! I removed the bacon blanket and snipped off the wing tips (both for the gravy), and covered the turkey in a double layer of foil to rest. From here, all that was left to be done was to roast the potatoes, make the red cabbage (thank-you Sandra for doing this!) and make the gravy. So much flavour in that gravy! Note to self - this year's gravy was a little bitter, so next year I gotta remember not to put the lemons in it. And here's the turkey! Ta-dah! 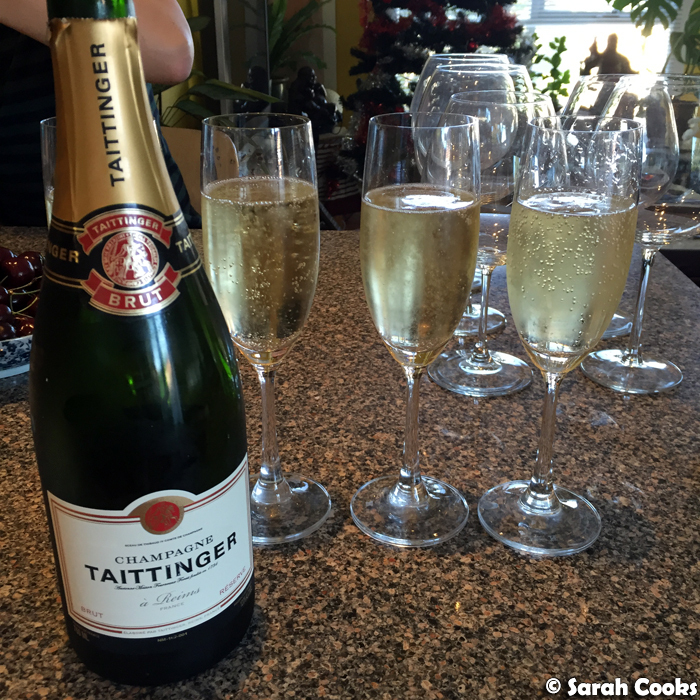 Then we could pop the Champagne and it was time to eat! My carving skills aren't great, but they sure have improved over the years! 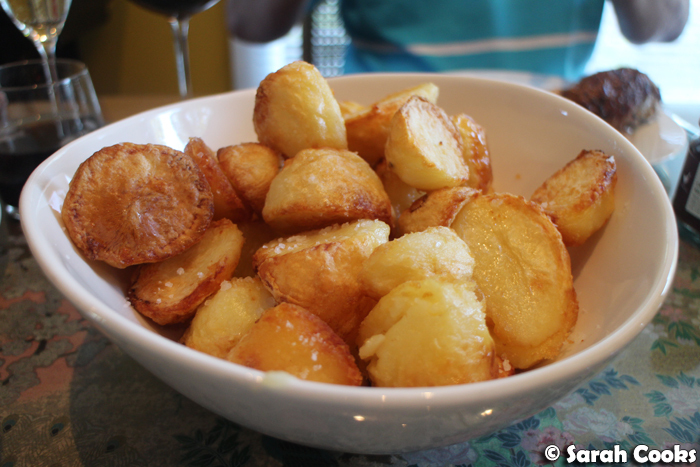 Potatoes, roasted in goosefat. Best. 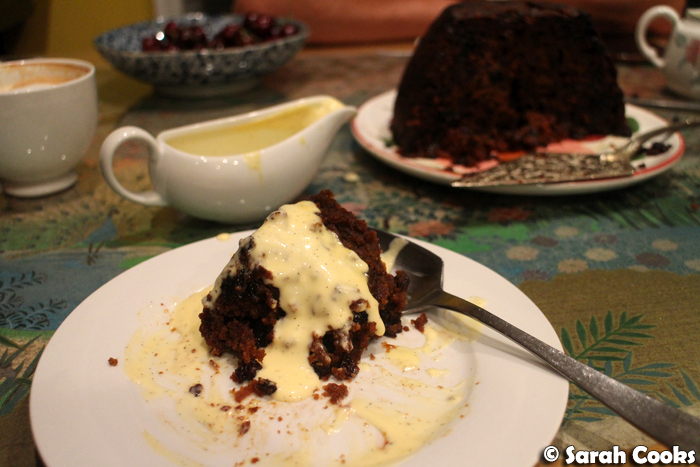 And dessert was, of course, Christmas pudding. 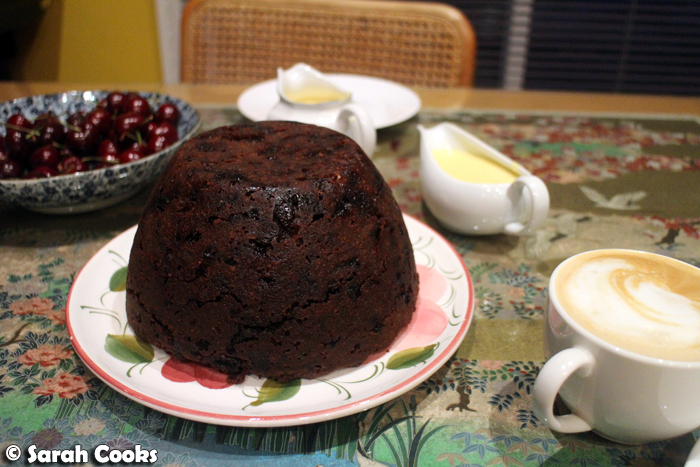 I made Nigella's Ultimate Christmas Pudding (which is my favourite of all the Christmas puddings I've ever made). I know you're supposed to make pudding weeks or months in advance, but I only actually made it the day before, after having steeped the fruits in Pedro Ximinez for a few days. It was still good! Very good! (Perhaps next year I'll be more organised). 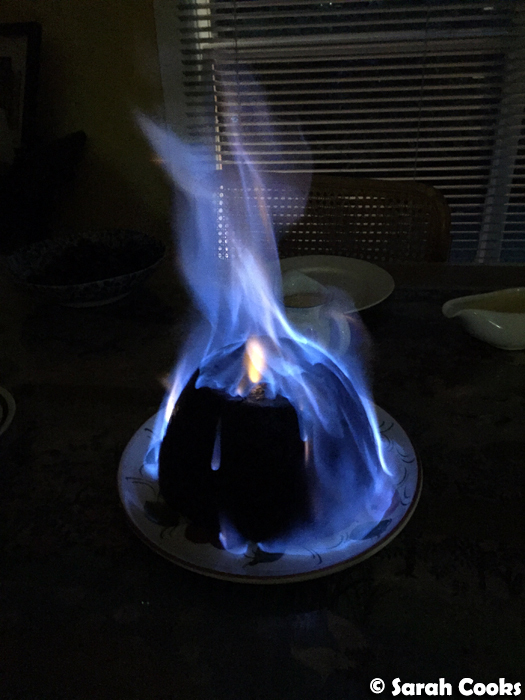 We flambéed it using Bacardi 151 (75.5% alcohol! ), which gave it a lovely bright blue flame! And I served it with vanilla bean custard, which I made while we were recovering from eating all that turkey. I'm very proud of myself that I can make custard without a recipe, woohoo. 2007 - Christmas in Germany! Hello hello and Merry Christmas, everybody! Hope you're all having a great day and that you were at the top of Santa's "good" list! I'm at my parents' place right now - we've done presents, had Hills BBQ takeaway for lunch, the turkey's in the oven now and I'm taking a quick little break! 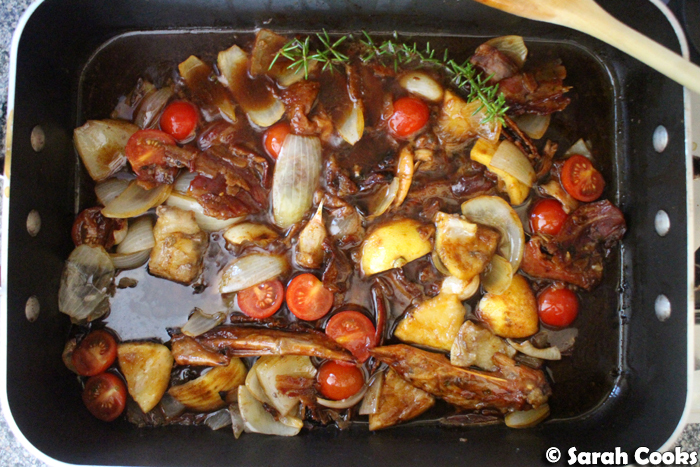 I'll blog about the meal in the next couple of days, but for today I wanted to share a quick Christmassy recipe with you! Earlier this week, we were lucky enough to be invited to the fabulous Shellie and Ewen's "The Night Before the Night Before the Night Before Christmas" party - there was great company, delicious eggnog, magnificent Kanelbulle, and a big bowl of these amazing salty-sweet-cinnamon pretzel things that I just Could Not Stop eating! Shellie kindly sent me the recipe after the party, and I went ahead and made a double batch to share* with my colleagues** at work*** before the Christmas break. They're so easy! 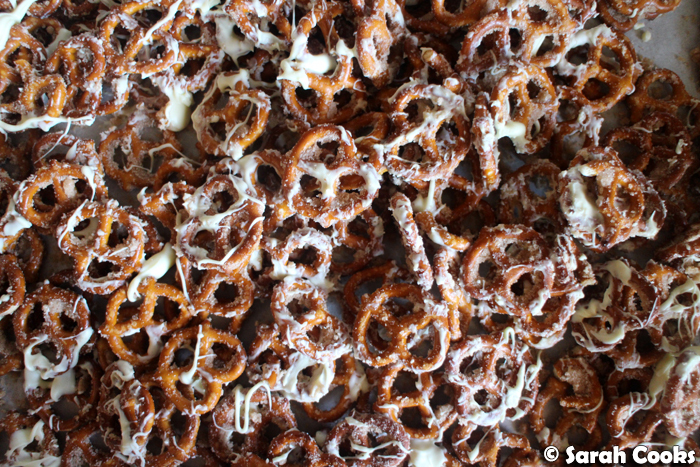 All you do is stir together some little crunchy pretzels through a mixture of melted butter, sugar and cinnamon, and bake them until they go extra crisp and are super fragrant. Once they've cooled, you drizzle them with melted white chocolate, so they look like a cinnamon roll! With their mix of salt and sugar in a cute and crunchy little package, they're seriously compulsive. I think they're awesome for parties, gifting, or general snacking. The original recipe comes from Crunchy Creamy Sweet, and is definitely a keeper! Preheat the oven to 175C, and line a large baking tray with baking paper. Melt the butter, and stir through the sugar and cinnamon. 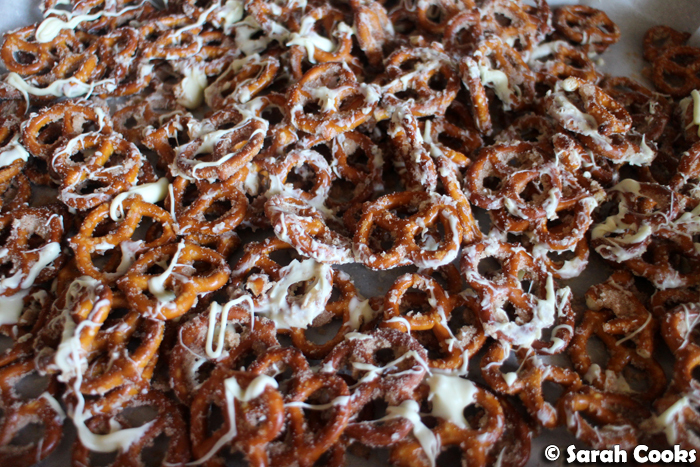 Pour this mixture over the pretzels, and toss gently to combine so that the pretzels are evenly coated in the mixture. Spread the pretzels out evenly over the tray. Bake for 12 minutes, or until they are slightly darkened and smell amazing! Allow to cool completely in the tray. Melt the chocolate chips, then drizzle haphazardly over the pretzels. Allow to set before serving. Keep any leftovers (hah!) in an airtight container. A couple of weeks ago, we treated my friend Adri to dinner at The Town Mouse for her birthday. This was actually my second visit to The Town Mouse. 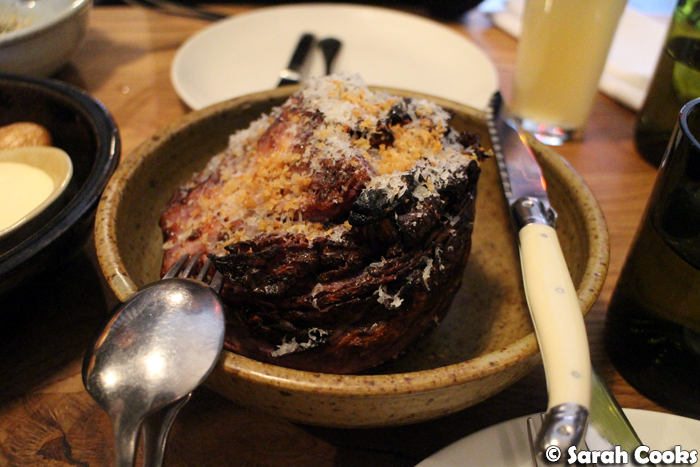 I never blogged the first visit - whoops - which was back in August 2014 with a group of fabulous food blogger friends. I remember liking it, but not being wowed by the meal. Indeed, my main memory was that we ordered the sharing menu, and that five of the dishes contained some sort of cabbage element. (Red cabbage green cabbage, kale, Brussels sprouts...) I love cabbage, but there was just so much of it! So I thought that The Town Mouse was good, but it wasn't at the top of my "must visit again" list. However, when our friend Adri hinted that she was keen to try the restaurant, we were more than happy to organise a visit as a birthday gift for her! And I'm glad I had a chance to visit again, because I greatly enjoyed it the second time around. Hooray! 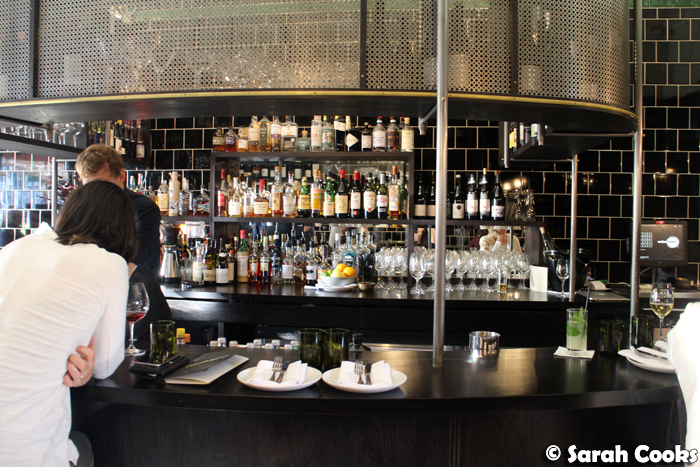 We were seated in the front section of the restaurant, at high tables on bar stools. Normally I don't like bar stools, but these were quite comfortable, and there were hooks provided for handbags and coats. 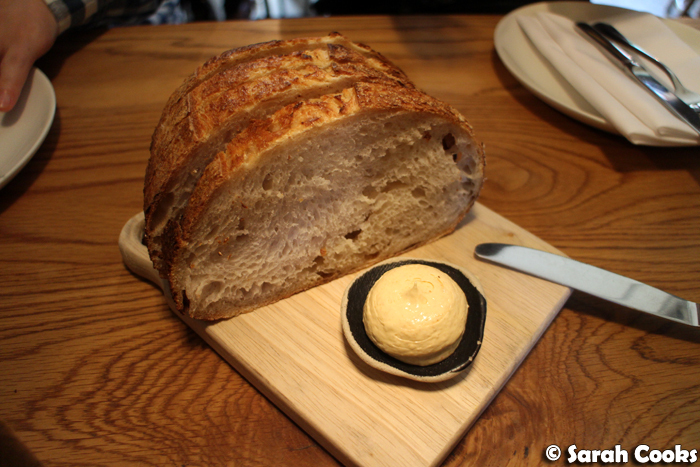 We started with warm bread, served with a gorgeous roast sesame butter. 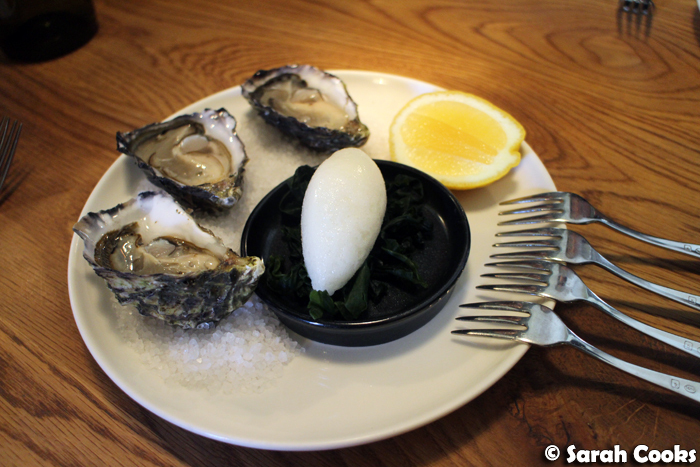 Between the four of us, we ordered four snacky starters to share - some oysters and cured meats, as well as goats cheese profiteroles and a luscious beef tartare. 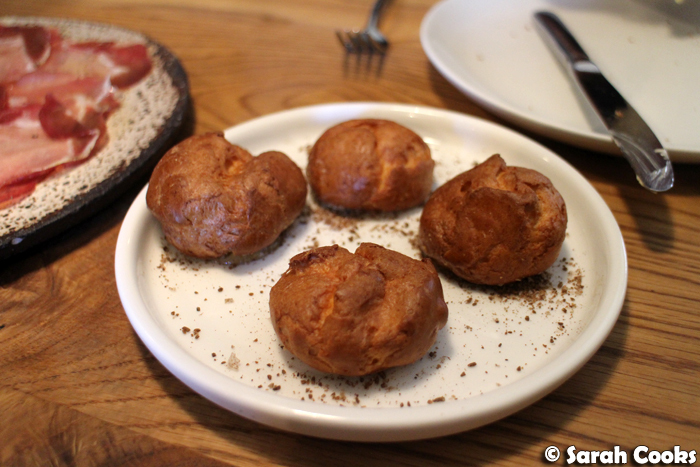 The goat's cheese profiteroles were a dish I'd previously tried, and they were just as nice this time around, with the honey adding a pleasant sweetness. The beef tartare was absolutely delicious. 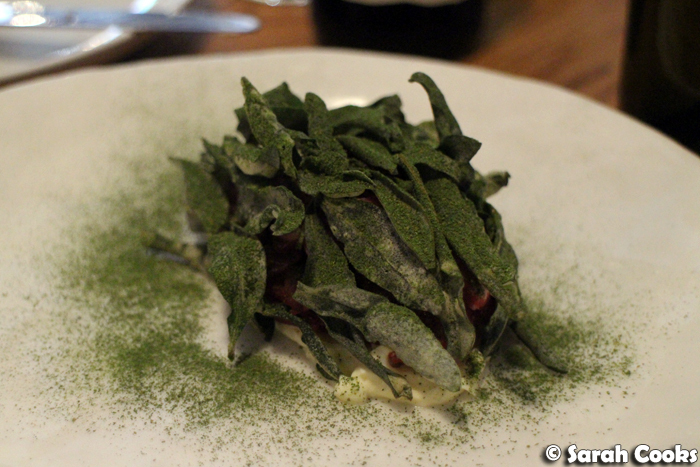 I loved the contrast of the herbal, crunchy saltbush leaves against the smooth cream and the soft chunks of beef. We ordered five main dishes to share - one meat and four vegetables. Interestingly, the meat was the least impressive of the main dishes that we ordered, and looking back, we would have been more than happy with just the vegetable dishes making up our main meal. So basically, what I'm saying here is that The Town Mouse does vegetables really, really well. 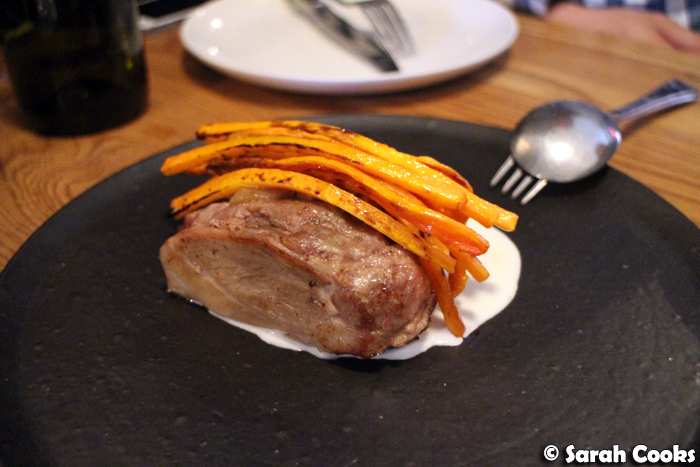 The pork hock was presented simply - a nice slab of juicy pork topped with thin slivers of charred carrots, sitting atop a yogurt sauce. It was tasty enough, and there certainly wasn't anything wrong with the dish; it just wasn't as exciting or tasty as the vegetable dishes. 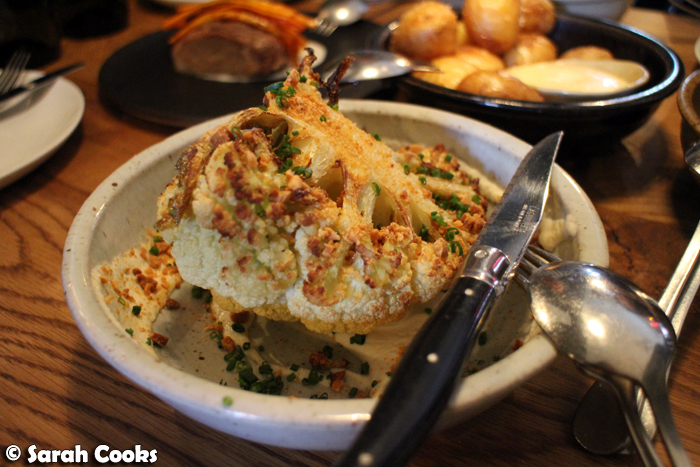 I love cauliflower, especially fried or roasted, and the addition of crunchy almonds, chives and punchy broad bean miso took it to another level. 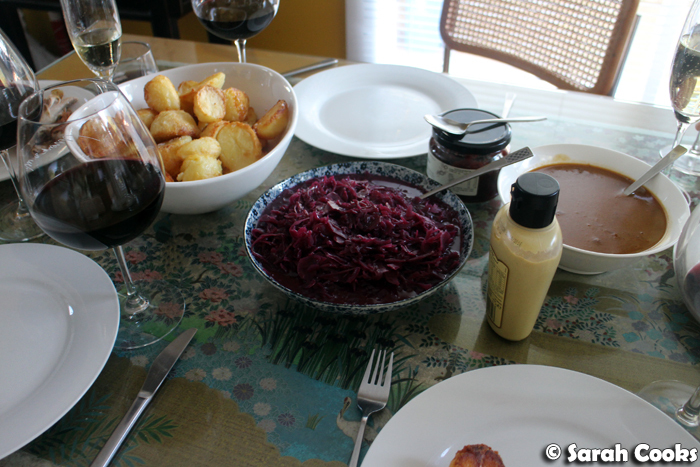 We had to do the famous red cabbage dish, which I think of as a fancy version of the German stewed red cabbage that Sandra and I love so much. Here, half a red cabbage is slowly cooked with buttermilk, prunes and red apple, before being placed under the grill with grated parmesan. This results in a soft, stewed, crunchy half-sphere of sweet and sour deliciousness. 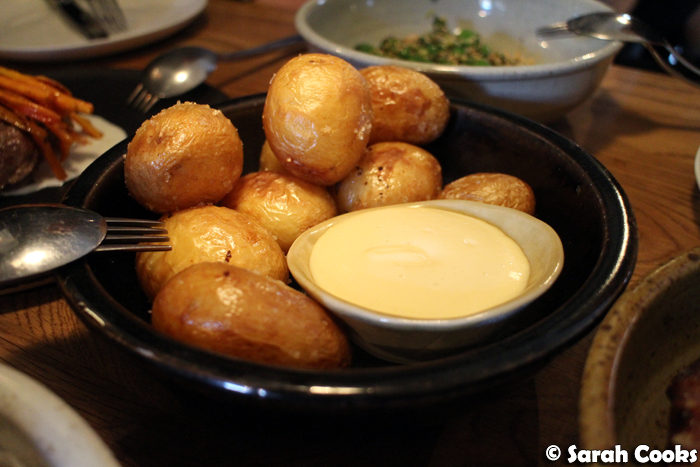 Fried potatoes with yuzu mayonnaise. Simple and perfect. 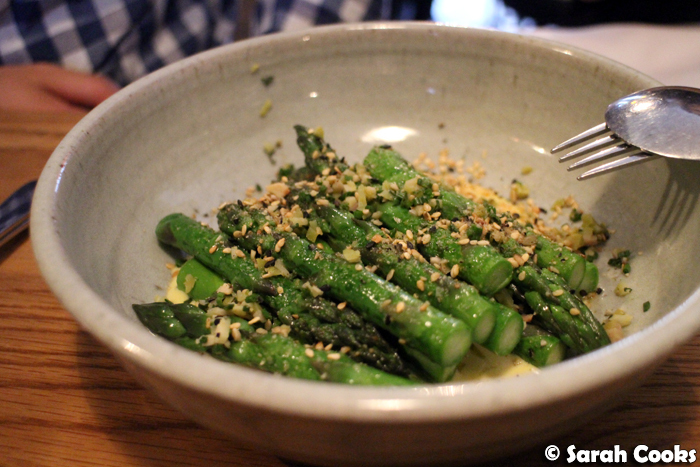 The asparagus dish was another winner, with the just-cooked, sprightly asparagus balancing well against the rich Comté custard. 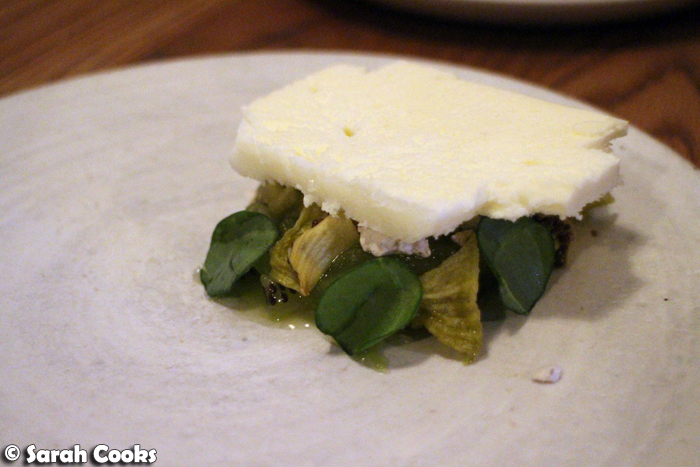 The yogurt parfait was light and refreshing, with a nice herbal flavour from the sorrel, and bitterness from crunchy coffee pieces cutting through the sweetness. The simplest of all the desserts was also our favourite. 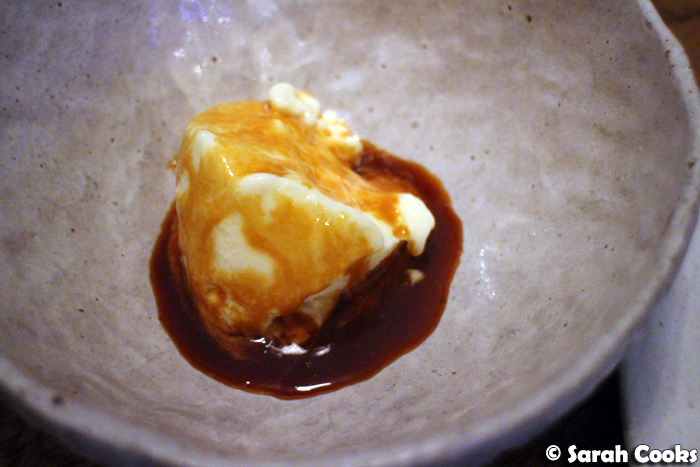 A scoop of smooth goat's milk ice-cream was topped with a really lovely lavender salted caramel. The salted caramel was rich and dark, with just a subtle hint of lavender. So delicious! Order one each and don't share! I love how the famous lime posset dessert looks like a still life from under the sea. 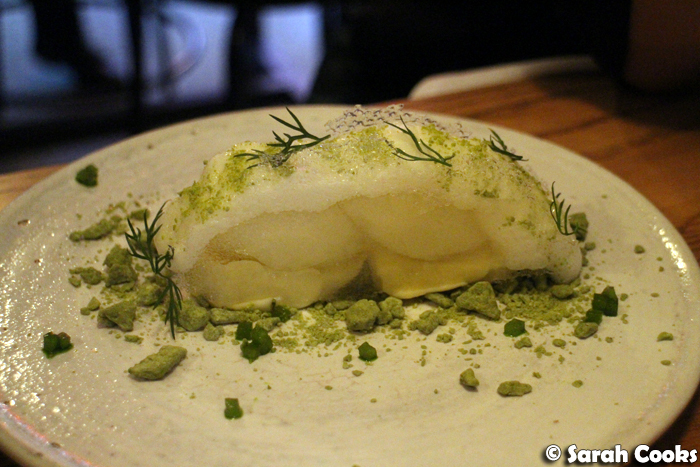 Surrounding the centre of lime posset is a green apple foam, with a small sprinkling of dill, and crunchy matcha pieces. And that was our dinner at The Town Mouse! We had a great time and enjoyed the food. I'm very glad Adri wanted to come here for her birthday!